L-Glutamine by Vital Labs gives you exactly what you need to dig deep and push the limits! Pumping iron and making gains is the name of the game! Are you spending countless hours in the gym trying to build the perfect body? Don't let muscle breakdown ruin your PROGRESS. Vital Labs provides us all the tools to build and maintain a rocking physique. 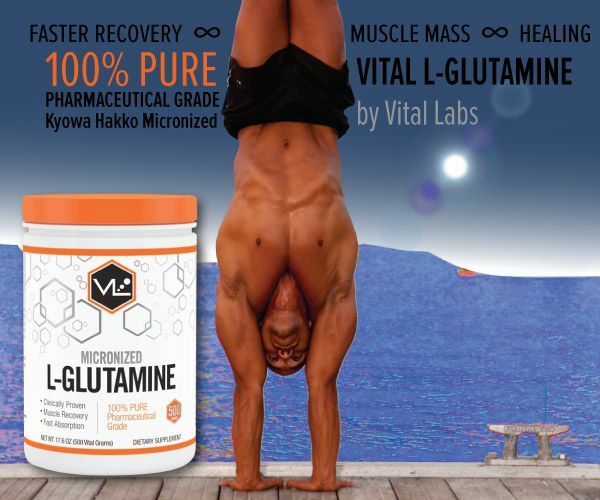 L-Glutamine by Vital Labs is a powerful amino acid supplement that is unflavored for ease of use. Glutamine plays huge role in building and preserving muscle mass. After intense training replenishing your Glutamine levels will prevent muscle breakdown, allowing for faster recovery and less soreness. L-Glutamine by Vital Labs is clinically proven and works around the clock to give your muscles fluid for maximum growth. Micronized Glutamine by VL is NOT a cheap impure glutamine like many online sellers use. VL brings you pharmaceutical Kyowa Hakko Micronized L-Glutamine; this is the purest, contaminant FREE glutamine in the world! Each batch is laboratory-tested and assayed to ensure that you are getting pure l-glutamine powder. Kyowa is an international health ingredients manufacturer and a world leader in the development, manufacturing and marketing of nutraceuticals, pharmaceuticals and food products.This is hugely important! People do not realize how important it is to put pure glutamine inside their bodies! DO not settle for crap glutamine! You deserve the purest and best for the maximum results! This fast absorbing workout drink is made from non-animal and all natural ingredients. L-Glutamine works by increasing cellular energy and nitrogen levels. L-Glutamine also protects your kidneys and muscles. VL Glutamine promotes oxygen bonding with hemoglobin. Oxygen is vital for all organs in your body and proper metabolism. This is due to the electron receptor in the electron transport chain, which yields up to 36 adenosine triphosphates. Muscle cells are rich in mitochondria, which relies on ATP to carry on cellular work. Simply put, L-Glutamine promotes Oxygen; Oxygen ensures metabolism, metabolism yields ATP, ATP feeds your mitochondria, mitochondria gives you muscle mass! For those who are training aggressively, the "suggested servings" are not going to get you the benefits and results you really need from this supplement. For optimal dosing take 10g before and after training as well as an additional 10g later or earlier. A total of 30 grams a day is best for optimal results. Many people mix a scoop of VL Glutamine as its unflavored into their protein shakes, pre and post workouts.